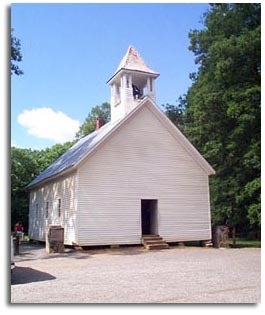 Cades Cove Primitive Baptist Church was organized in 1827. This is the oldest established church in Cades Cove and was originally in a log building until 1887. Names from most of the families who first settled in the cove can be found in The graveyard behind the church; Oliver, Gregory's, Shields and more. Noticing the dates infants deaths were not uncommon reminding us of some of the difficulties of living in those times. The following is a partial list of people who are buried in the cemetery behind Primitive Baptist Church. If you know of any additional names or have any additional details about those already listed here please let us know. Oliver Martha (wife of John) 1846 19? ?